Kantar Worldpanel, the global market leader in consumer panels, reports the spending in fast moving consumer goods (FMCG) in 2017 grew by 4.3% year on year, which is 0.7pt faster than 2016. This signals the end of the slowdown China has experienced over the recent years and gives optimism to FMCG manufacturers and retailers looking to expand their footprint and find new shoppers in 2018. Across all regions, the West and North regions reported a more upbeat trend, up by 6.0% and 4.7% respectively, contributing to the overall growth of China. Modern trade (including hypermarkets, supermarkets, and convenience stores) grew by 2.6%, while last year this channel only grew by 1.6%. Leading modern trade retailers strived to introduce new business models as well as O2O initiatives to actively meet the demand of Chinese shoppers in the new era. Most of the top retailers in China performed strongly in 2017, thanks to both new store openings and expanding their format portfolio. Sun Art group continued to strengthen its position, growing their share from 8.1% to 8.4% on annual basis, while Yonghui remained the fastest growing player, with 0.3 share point increase year on year. Armed by its new Super Species format (supermarket + fine dining) and YH Life (neighborhood store + O2O delivery), Yonghui went from strength to strength, overtaking Carrefour and becoming the 4th largest retailer in the last quarter of 2017. Amongst the regional players, Bubugao Better Life, Wumart and SPAR continued to outperform their peers through their aggressive regional expansion and their embracing of new retail initiatives. International retailers as a group further weakened in 2017, with share reduced from 11.1% in 2016 to 10.3% in 2017. 2017 was also a year that tech giants Alibaba and Tencent were moving from the online world to the offline world by putting their investment into the heated retail battle between supermarkets. By end of 2017, the Tencent/JD camp (including Yonghui, Carrefour, BuBuGao and Walmart) reported 12.8% share, higher than 11.1% recorded by Alibaba camp (Sun Art and Balian). Both giants are embarking on active transformation of the Chinese retail infrastructure in a number of different ways. 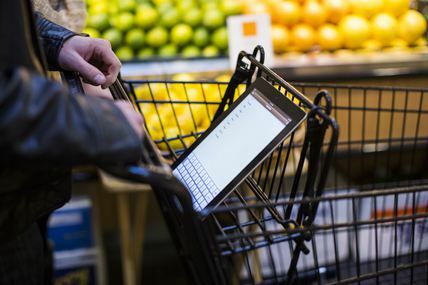 Kantar Worldpanel reported a strong growth of 29% in FMCG spend by e-commerce year on year. In 2017 60% of China urban families purchased FMCG online, 5.4 percentage points higher than the previous year. In Key cities, almost 70% of households purchase FMCG online. Furthermore, higher frequency also contributed to the growth as online shopping becomes more of a routine in consumers’ lives, fueled by the rapid growth of mobile eCommerce. In 2017, shoppers purchased from e-commerce on average 7 times a year. The China retail market will see more equity investments from ecommerce & tech giants such as Alibaba, Tencent and JD. The integration is set to help accelerate the recovery of modern trade, by directing consumer traffic back to the brick and mortar stores and utilizing the distribution network to deliver to consumers in a faster and more cost efficient manner. The integration will also see offline stores carrying the best-selling merchandise from ecommerce platforms, as is evident from RT-mart’s recent listing of best-selling items from Tmall, as well as the optimization of assortment in grocery stores empowered by Tmall and JD. Kantar Worldpanel reports that the spend in fresh food in the latest 52 weeks ending November 2017 grew by 38% in ecommerce channels, as more fresh food specialists are expanding their logistic capability and assortment to attract more online shoppers. Given its high frequency and essential role in grocery basket, fresh food is a key destination category for both brick & mortar retailer and e-commerce giants. As Hema aggressively expanded its franchise nationally and JD launched its 7 Fresh format, more traditional retailers are following suit to fight for the most resilient consumer demand. The battle will intensify in 2018, as more focus is put on fresh to fight for a bigger slice of pie. Pure big box format in China struggled to grow amongst younger middle class shoppers as the result of an increase in the more appealing hybrid concept formats. While the Hema model will be increasingly duplicated, unmanned stores are the new favourites with investors although scalability and profitability remain questionable. Dmall APP + physical store network will expand to more retailers, helping them to capitalize existing store assets through tech empowerment. At regional or provincial level, the FMCG market remained fragmented and this indicates more room for cross-provincial expansion and acquisition. With its investment in Zhongbai and Hongqi, Yonghui was able to expand its presence into adjacent provinces where local market leaders dominate. SPAR, on the other hand, developed more franchises in Hebei and Yunan over the past two years, as well continuing its organic expansion within its existing partners’ territories. In China, the West and North regions see more opportunities for further consolidation.